Agree with previous reviews about difficulties getting to the campground. We arrived on a Sunday; therefore the gate we needed to take was closed! After some fancy maneuvering, we made it in. The installation has little to no signage for the RV campground. We relied on directions from the staff, which ended up being difficult to follow as well. However, we finally made it back into the campground. The initial impression is nice. 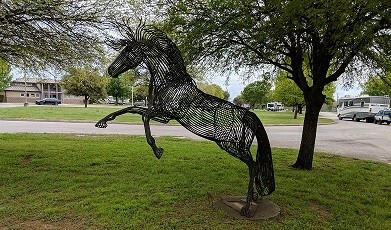 A metal horse sculpture greets you at the entrance, then the registration building is obvious and straight ahead. Our site (can't remember the site number) was at the very end, closest to the dog park with a 6' tall, probably 50'-60' long (if you like to play frisbee with the dog). It is also closest to the horse stables. We saw horses and people riding horses each day of our trip! It was relaxing. If you have kids, the playground was one of the best I've seen. 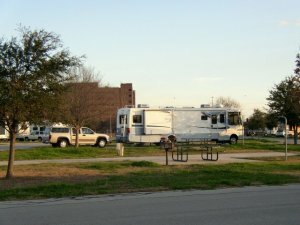 The sites were plenty long for us to park our 36' motorhome and toad behind. Water connection leaked (their issue, not ours). The picnic tables were larger than any others we have seen. That was a plus! 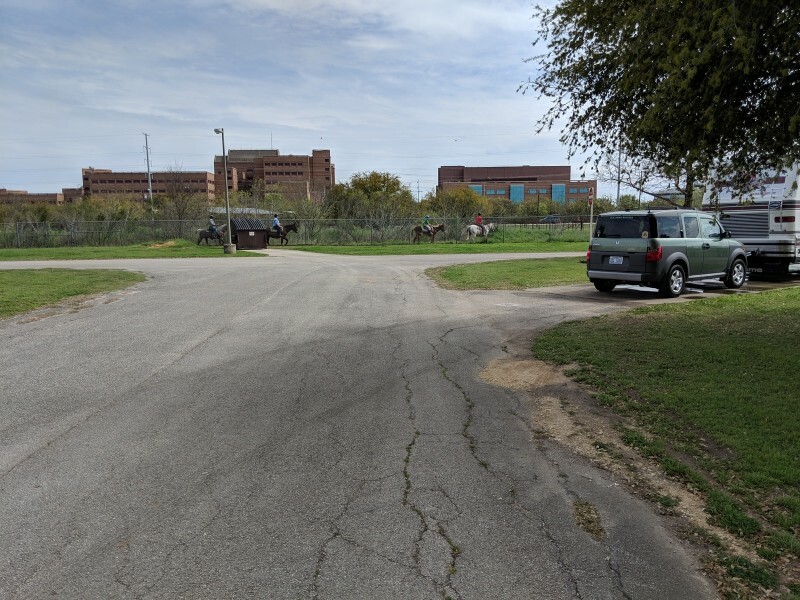 Our site was also closest to the railroad tracks and, as you've read in other posts, the train noise is loud, very loud and can run all through the night. Staff were friendly but I did have some issues with trying to pay for an additional night. When I went to the office to ask, I was told I hadn't paid for any of our stay. I brought back the receipt to show where we did pay. We finally got everything straightened out. Overall the location was really good to San Antonio, The Alamo, etc. We will stay here again!